We have been experimenting with Sea Cucumbers for the last few months. These gelatinous bottom dwelling creatures are quite bizarre even by my standards! When they encounter a predator they excrete their digestive track and internal organs, giving the attacker something to stay occupied with while the cucumber slowly undulates away. They are then able to re-generate these organs and carry on their life as normal. You will occasionally find Sea Cucumber, often in dried form, in some dishes across Asia. Here in the United States they remain quite rare, especially in their live form. Inside each cucumber is a series of white strips of muscle that run vertically inside the body cavity. When removed they are incredibly tender and sweet, reminiscent of the delicate flavor of razor clams. In my opinion, these are by far the most choice part of the sea cucumber, unfortunately, however, they only make up 5% of the total body weight. Once you remove these muscles you are left with a tough, gelatinous, shoe shaped object dripping with slime and constricting into a tight cylinder. After several disastrous attempts to make this outer part edible I threw in the towel and decided just to use the interior muscles. In the back of my mind I had an idea that if I were to cook the outer portion of the sea cucumber enough it would become soft - but even after six hours of simmering it was still like eating a rubber band. Finally I decided to cook them until they become soft, no matter how long it took. I sliced them into thin strips and 14 hours later they transformed from rubber bands into more palatable soft gelatinous strips. I transferred these strips to the dehydrator overnight and then dropped them in 500 degree canola oil where they puffed up like chicharones. After a seasoning of sea salt and espelette, they tasted incredible with an airy crunch rivaling the best chicharones I have tasted! 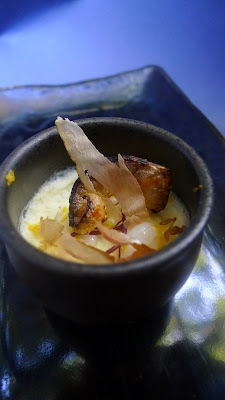 We have featured the local sea cucumber on top of a chawanmushi-style custard with raw sea cucumber on top and the crispy sea cucumber chips to garnish.